* Voyage handbook - NEW edition of the Baboon file! Events needing volunteers (including young people) - please apply now! Do you know a young person from Dorset who deserves a FREE voyage? Do you know a young person from the Isle of Wight who deserves a FREE voyage? Eddystone Charity Pursuit - can you take part? This week's voyage was a mixed group involving a number of young carers, Chris Ellis award winners (young people who had sailed last year and won a competition to come again), young people from several local schools, and a couple of young apprentices from Aston Martin, part of a new project this season where we are working with the company to support their apprentices completing the Duke of Edinburgh's Gold Award. They joined the boat after lunch on Friday and did lots of introductions and briefings before heading down to Cowes in time for dinner. The whole team got together for a chat about the weather forecast and plans for the week, and all agreed to head for Poole the next day. Unfortunately this involved a 6am start because of the tide! It was very cold and windy and it was impressive to see all the young people on deck so early to get the boat ready to leave. They got the main and mizzen sails up and headed out through the Needles in blustery conditions. Then the staysail went up and they had a really fast sail though some people were clearly finding the conditions uncomfortable. They were relieved to get into Poole and safely alongside by 1pm, with plenty of time for shore leave and training towards their sailing qualifications, before dinner and games. After a bit of lie-in on Sunday, 12-year old Tommy took charge of driving the boat out of the harbour despite barely being tall enough to see where he was going, even standing on a box, with engineer Josh guiding him. They had another good sail back into the Solent where they did a man overboard recovery exercise before heading into Lymington. After two big days of sailing in the cold and the wind, with quite a young crew (all but three aged 11-14, some of them quite small) the team decided to plan a different sort of day on Monday. It was still blowing a good Force 5-6 but rather than sailing, which involves challenging sail hoists and long hours on deck, they agreed to do some navigation exercises under motor, with different teams responsible for taking the boat to specific places on the chart. Crucially this meant shorter times on deck and more chances to warm up inside while using charts and instruments! They got into Cowes for a late lunch and then had time for showers and shore leave before planning a last navigation exercise – this time in the dark back up to Southampton. They finished the voyage having sailed 80 nautical miles. All 14 young people who completed the voyage earned RYA Start Yachting certificates (sadly one young person was ill and had to leave the voyage early). 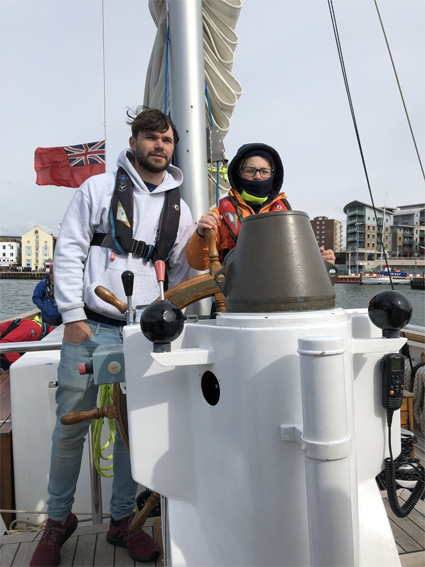 Both the Aston Martin apprentices earned recommendations to come back and train as volunteer sea staff if they want to; and three 14-year olds were told that they have the potential to be sea staff when they are old enough (the minimum age for a trainee bosun is 16). Big thanks to sea staff Andy V, Martyn, Josh, Jake, Cathy, Willoughby and Archie. Another voyage started yesterday with an older group including some more young carers, individual bookings and a group of care leavers who came to us via the Rees Foundation, a new partnership for OYT South. 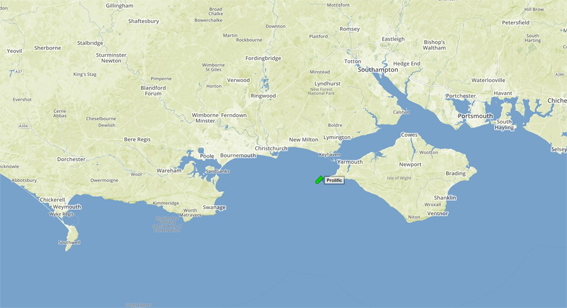 They went to Yarmouth last night and today they are heading west and hoping to make a good long passage before working their way back. Big thanks to sea staff Andy B, Graeme, Josh, Adam, Nick, Jake, Di and Archie. There will be a proper report on this voyage in the next newsletter. There is a maintenance day on board Prolific in Ocean Village this coming Monday - please help if you can! Skilled and unskilled help needed. Over-18s welcome. 16 and 17-year olds may be allowed to help at the skipper's discretion and depending on what work needs to be done, but trainee bosuns and young people who have had sea staff recommendations should certainly ask if they can help at a maintenance day. We normally need people on board from around 9am to 5pm, and lunch is provided on board. Email refit@oytsouth.org so the skipper knows you are coming and can plan jobs and meals for you, or call the boat on 07990 518915 (but bear in mind they are on a voyage until midday on Sunday). There is a NEW edition of the voyage handbook (commonly known as the baboon file but only because of an illustration that used to be on the cover!) available online for sea staff and volunteers in the password-access section of the website. This document covers a huge range of material that watchleaders need to know, from our standard routines for sail hoists and drops, what to do in emergencies, and how to fill in the logbook, launch the dinghy, organise an anchor watch, fit preventers and more. It also has a set of key policy documents. The new edition will also be available on board very shortly. You'll easily be able to see what's different compared with last season as all new text is in blue while the older material is in black. There are very few major changes but quite a few updates and improvements, and some new sections added which hadn't been written last season. It’s obviously a long document and no-one expects watchleaders to learn it off by heart but do please use it to give yourself confidence before a voyage and remind yourself about anything where you might be unsure! Sea staff who don’t have a login for the members-only section of the website, please email webmaster1@oytsouth.org. Our 2019 sailing programme is available here - and voyages are selling very fast! 24-29 June, Southampton to Poole, 5 nights, age range 12-25, £490 per person, up to 8 berths available. This could be an ideal voyage for people who have finished exams - the bookings we have so far are for people aged 16-19. Passports needed as we may have the opportunity to sail to France, weather permitting. 16-22 July, Falmouth to Brixham, 6 nights, age range 12-25, £575 per person, at least 10 berths available. Passports needed as we may have the opportunity to sail to France, weather permitting. 29 July - 4 August, Brixham, 6 nights, age range 12-25, £575 per person, up to 5 berths available. Passports needed as we may have the opportunity to sail to France, weather permitting. 14-20 Aug, Brixham, 6 nights, age range 12-25, £575 per person, 3 or 4 berths available. Passports needed as we may have the opportunity to sail to France, weather permitting. 27 Aug - 1 Sept, Poole to Southampton, 5 nights, age range 12-25, £490 per person, up to 4 berths available. Passports needed as we may have the opportunity to sail to France, weather permitting. 18-22 Oct, Southampton, 4 nights, age range 12-25, £375 per person, up to 6 berths possibly available tbc. If you would like to make a booking at any point in the 2019 season, please email caroline.white@oytsouth.org. We have a few voyages where volunteers MAY need to drop out of places they have booked, for reasons such as waiting to hear about possible new jobs and internships. Could you be a reserve for one of the following voyages if someone does need to cancel their place? 2-6 Oct, Southampton - experienced watchleader possibly needed. Email webmaster1@oytsouth.org if you could be the reserve for any of these voyages. All dates given are when young people or clients are on board so we generally need volunteers the afternoon before (or the evening before for day sails). Prolific is booked for some boat shows this year when we will need volunteers to get people interested in Ocean Youth Trust South! The South Coast Boat Show is in Ocean Village, Southampton when Prolific will be involved on Saturday 18th and Sunday 19th May, working with our major sponsors Marina Developments Limited. MDL is going to provide us with ingredients to serve tea, coffee and bacon rolls on board in exchange for donations - a great opportunity to show people around Prolific and talk about our work. Next is the Poole Harbour Boat Show on the weekend of 7th-9th June. OYT South is the chosen charity for this event and they have raised funds to send Dorset young people sailing with us in the summer. Some of the winners should be on board during the show, which is always a fabulous event with huge numbers of visitors wanting tours of Prolific. Both the Southampton and Poole events will need LOTS of volunteers - we need to supervise the gangway and all the steps to keep visitors safe; to run tours of the boat and talk about our work; to collect contact details for anyone interested in sailing with us or supporting us; and to allow for teams of volunteers to swap round so people get proper breaks! Obviously we want to involve our usual volunteers but it would also be great to have some young people who have sailed with us (with a parent or carer if appropriate). Anyone interested, please email us and tell us which event you'd like to be involved with and which days you are available. We have two remaining voyages in 2019 earmarked for volunteer training for adults (18+), These are designed both for current volunteers who want to improve their own skills in sailing Prolific, on a voyage where they don't have to be supervising young people at the same time; and also for new potential volunteers who want to come along and find out what it's all about and how we work. They are also intended to be a lot of fun - please BOOK NOW! 3-7 June, Southampton to Poole (2pm Monday to 12 noon Friday), £395 (but see below about the cost). Passports required as we may sail to France if the weather allows. Between two and four places left depending on whether provisional bookings are confirmed. 11-13 October, Southampton (8pm Friday to 5pm Sunday), £200 (but see below about the cost). Nine or 10 places left. The cost of volunteer training voyages is designed as a contribution to charitable funds from those who can afford it, and it includes a year's annual membership. Current and potential volunteers who still can't afford it, please apply to webmaster1@oytsouth.org for bursary funding - no-one who is already a valuable volunteer interested in improving their skills should be excluded from these voyages by the cost; and new potential volunteers who seem to have a lot to offer the charity are also welcome to apply as we will be keen to invest in getting you trained and familiar with the boat. Email webmaster1@oytsouth.org to reserve a place, or for more information. A few times each year we run day sails in Prolific which are ideal for sponsors, new prospective supporters and clients, and anyone who has helped the charity or is interested in helping the charity or finding out more about us, but wouldn't otherwise have the chance to sail with us. This can include family members of our volunteers - we know people give up significant amounts of time at home in order to sail with us so it might be a good idea to offer a day sail to thank the family which lets you go away - and show them what you do when you go! Day sails run 0930 to 1700 from Ocean Village, Southampton, and include lunch on board. If you would like to be invited or to nominate someone else for an invitation, email webmaster1@oytsouth.org. Please tell your friends and spread the word around anyone who might be interested in working with us - teachers, youthworkers etc who might like to arrange a voyage for young people; possible future donors and sponsors; or anyone who might be a useful contact. These days are a great opportunity for us to impress people and make new friends! With this summer's voyages filling up fast, plans are becoming clearer for summer 2020. 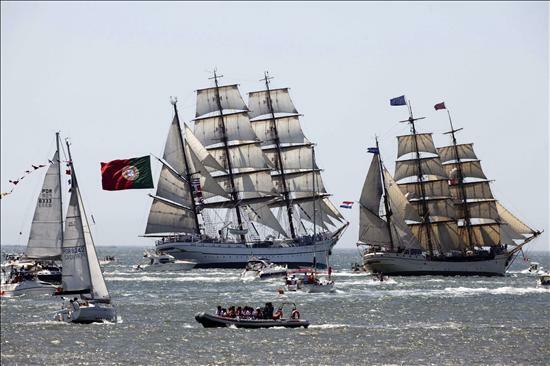 Our current plan is to sail down to the Tall Ships festival in A Coruna in Spain in July and take part in the Tall Ships race to Dunkirk (another great festival). Then we'll cruise back to Southampton in time to run a voyage which will include the Mayflower Small Ships Race to Dartmouth - part of the 400th anniversary celebrations for the Mayflower sailing to the New World. Then we'll have another voyage taking us back to Southampton in time for the end of the school summer holidays. This programme should provide a brilliant mix of voyages: overseas adventures; more affordable local south coast trips; races and cruises; something for older and more able crew members and other dates for younger people and novices needing a gentler introduction to sailing. No part of this programme is yet set in stone and we are also happy to talk to clients about other options. 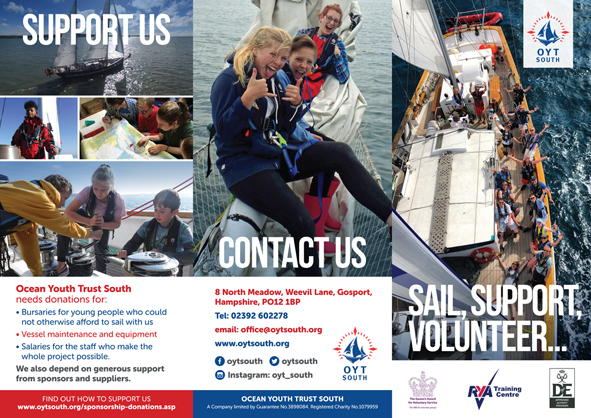 We have been updating OYT South's publicity material and you can see some leaflets here including updates of some of last year's leaflets plus a new one which you can see below about getting involved, called "Sail with us, volunteer with us, support us". (This one is designed to be folded into thirds). Please do email the pdf or the link to anyone you think might be interested. You are welcome to print from the website if you like (don't print the version below from the newsletter which is very low-resolution! ), but if you need high-quality printed copies, they are available from the office - just let us know which leaflet(s) you want and how many copies and we can send them out. Huge thanks to the Marine Advertising Agency for their work on the design! Don’t forget you can always have a look and see where Prolific is sailing. If you discover she is in a harbour somewhere near you, please go and say hello. If we’re not too busy with activities with young people, then visitors are generally welcome. You can always call the boat beforehand (07990 518915) to see if there is time for a visit - and sometimes you may be just what we need if you have local information or a bit of time to spare to help with something, or a car for running a quick errand! Big thanks to the Graham High Charity who sponsor our vessel tracking. With Ocean Youth Trust South being the nominated charity for this year's Poole Harbour Boat Show, thanks to fantastic fundraising efforts by Tracy and Kerrie from the Boat Show team and also to some very generous donors, the Boat Show organisers and Poole Harbour Commissioners have paid for 15 places on a voyage in Prolific in August for young people living in Dorset. So now they are looking for 15 young people to fill the places! Guidelines and a nomination form, along with voyage details and dates are now available - do have a look. The criteria are very broad so almost anyone aged 12-18 and living in Dorset could potentially be eligible. Please do all you can to spread the word - tell your friends, and if you know any teachers, youth workers, social workers or anyone else in Dorset who might help, please send them the link. Thanks to kind supporters on the Isle of Wight and the fundraising efforts of Ocean Youth Trust South's Island Support group, we are delighted to offer six young people from the Isle of Wight the opportunity to join a FREE voyage 18th to 22nd October 2019 (starting on the Friday evening at the beginning of half-term). Details and a nomination form are available here. Online fundraising - raise money with minimal effort! OYT South is now registered with Amazon Smile which makes donations to us when people shop - Amazon will donate 0.5% of the net purchase price on eligible purchases. If you ever shop with Amazon, do have a look - once you pick Ocean Youth Trust South as your chosen charity and start using https://smile.amazon.co.uk, you don’t need to do anything further, and all your other Amazon account settings remain unchanged. We also receive donations through Easyfundraising - this one works for all sorts of online shopping, not just a single site like Amazon. One of our volunteers says “I booked a Citybreak weekend away on Expedia and car parking on Holiday Extras through Easyfundraising and that produced £18.28 for OYT South at zero cost to me.” Easyfundraising says: "It doesn't cost you a penny extra. When you shop the easyfundraising way with one of our 3,241 shops and sites they give us a commission for your purchase. We turn that into a donation and give it to your good cause. Easy!" If all our supporters got into the habit of raising money for us when shopping online, it would soon mount up. If you can persuade your friends and family to do it, even better. And if you work for a business which spends significant sums online, who knows how much you could raise? Huge thanks this week to the Baily Thomas Charitable Fund for a very generous donation to support places for crew members with learning disabilities; and to the Seven Seas Baxter and Grimshaw Trust for a very generous donation for crew members who have been homeless. We need a regular flow of funds to cover at least three major areas: bursaries for young people who could not otherwise afford to sail; vessel maintenance and equipment; and staff salaries - please help, or pass on our details to anyone you come across who might make a grant, large or small. See here for how to make a donation - you can contribute by cheque, phone or PayPal, but please do something if you possibly can. Don't forget that if you complete and return a Gift Aid form (pdf) we can claim back tax on your donation. We recently announced the winners of the Chris Ellis Award for the 2018 sailing season and we are now open for 2019 entries. If you enjoy a voyage with OYT South and want to come again (and are aged 12-25), please think about entering for this award. You can win up to £500 off the price of another voyage, by sending in an account of a voyage you have already done with us. It can be a logbook, diary, story, pictures, video - anything which gives the judges an idea of why you had a good time and would like to come again. The prize is judged at the end of each season and the award can be spent on a voyage the following year. Entries should be emailed to webmaster1@oytsouth.org or posted to the office. See here for more details of this award, which was set up in memory of the charity's founder. You can also see some previous winning entries. 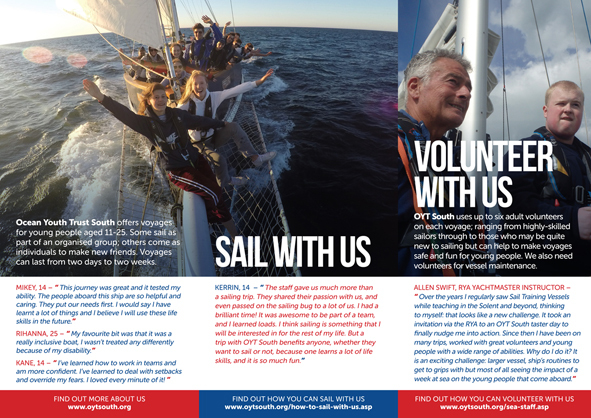 OYT South has a rule that at least one member of the Board of Trustees - which runs the charity - should be in the same age range as the young people who sail with us. The current Youth Trustee is Lauren Mackenzie, aged 18. Lauren first sailed with us for her gold DofE and quickly started volunteering with us, qualifying as a watchleader as soon as she was old enough and then being upgraded to second mate last September. She is currently in her first year at university, studying maths at Oxford. Lauren is in a position to speak up for young crew members, suggest changes in the way the charity operates or to do anything else which will improve the experience of the young people who sail with us. If you are a young person and you have ideas or suggestions for how we can do better, and you want to talk to someone close to your own age, you can contact Lauren. If you’re not happy with something and want to know what to do about it, you might want to start by talking to Lauren. If you want to get more involved - whether by just doing another voyage, or by training as a volunteer - Lauren can point you in the right direction. You can email her at laurenmackenzie@oytsouth.org. * Eddystone Charity Pursuit - can you take part? One of our volunteers, Sandy Garrity, has entered his boat Aphrodite in the Eddystone Charity Pursuit (the South West’s largest sailing fundraising event).on Saturday 15th June this year to raise money for OYT South, and he wonders if anyone else might like to get involved? Sandy says it's "a sort of brisk sail in company from Plymouth round the Eddystone and back - a distance of 26 nautical miles." Sandy has already raised 45% of his fundraising target, which is a fantastic effort; but it's not too late if anyone wants to sail with Sandy or enter their own boat to join him for the team event. Each boat entered is responsible for raising money for their chosen charity, but there is also a prize fund with money for entering and completing the course plus a bit for early entry; money for the largest amounts of cash earned for your charity - the skippers declare the amount of cash that they have raised at the skipper's briefing; money for your place in the fleet; and money for a team event (up to three boats, or multiples of three). Sandy says: "To maximise the money from the prize pool we need to enter early, raise lots of sponsorship and ideally have a team of three plus." 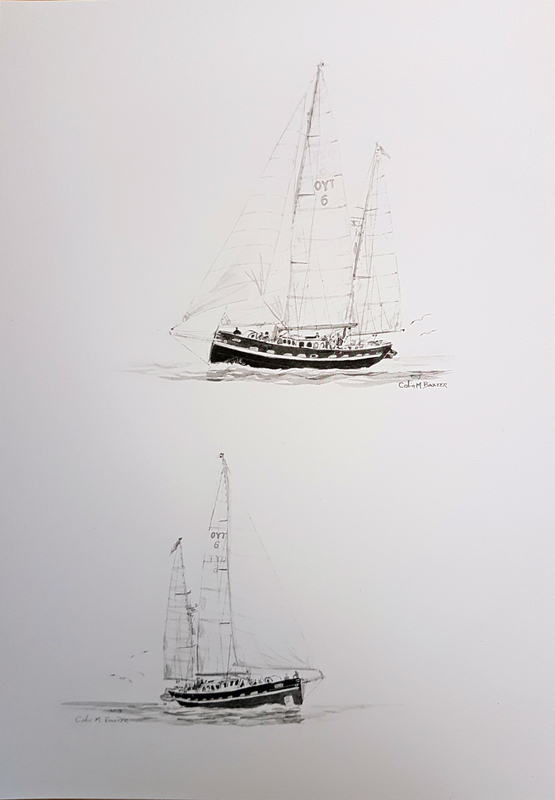 So: if you have your own boat and it satisfies the entry requirements (suitably equipped to sail offshore, must be capable of reefing, have an engine (preferably inboard) and a keel, and capable, under reasonable weather conditions, of completing the course within 8 hours), would you like to enter? Could you talk to any friends with boats to see if they would enter on behalf of OYT South? 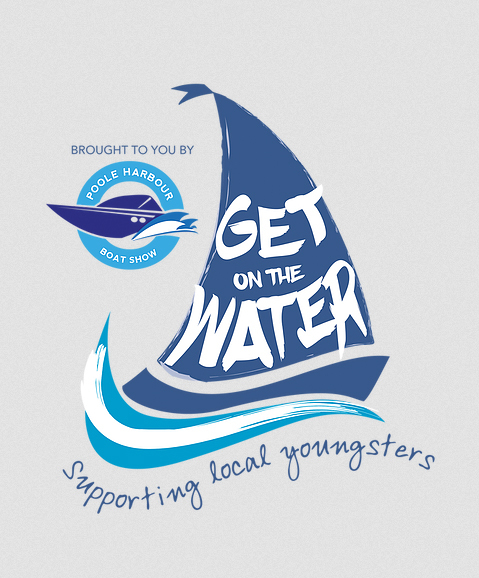 Any skippers who want to take part: you would need to enter and nominate Ocean Youth Trust South as your chosen charity. You also need to let us know that you are entering on our behalf, and we'll put you in touch with Sandy. Then you need to think about raising funds. Sandy has set up a Justgiving page so that funds come directly to the charity - this means that skippers don't have to handle any money and it's easy to demonstrate to the event organisers exactly what has been raised. This is very easy to do for any other boat which enters. There may also be OYT South volunteers who don't have a boat but would be interested in crewing for any skipper who needs someone - email us and we'll put you in touch with Sandy. Occasional OYT South relief skipper Simon Jinks's company SeaRegs is now offering RYA practical coursers on a regular basis. This year they have a monthly programme of both Sail and Power Yachtmaster weeks and Day Skipper weeks, as well as both classroom based and online theory courses. A 10% discount is available for booking both a theory course and a practical course. Contact Vicky Jinks admin@searegs.co.uk if you are interested - please DON'T reply to the OYT South staff via the bulletin for this one! 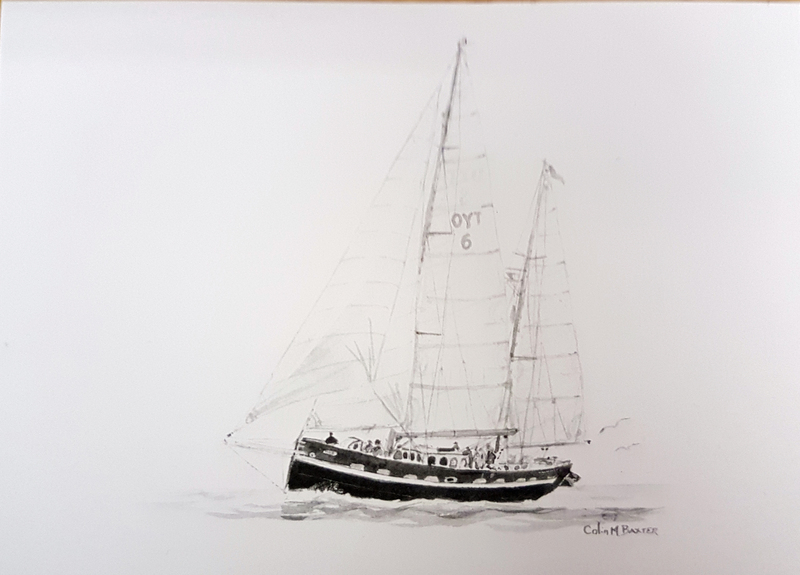 We have a limited number of A4 prints and postcards of Prolific by the renowned marine artist Colin Baxter for sale - postcards cost £1 each and prints £6 each, including postage and packaging. Email joclark@oytsouth.org to order. OYT South branded clothing available - please see here. You can buy hoodies (in a wide range of colours), fleeces, short- and long-sleeved t-shirts, baseball caps, beanie hats, polo shirts and more, all with OYT South's logo! Have you recently done a voyage as a young crew member, enjoyed it, and been told by the skipper or any of the other sea staff to think about coming back as a volunteer on board? This is how many of our watchleaders and bosuns started, and it’s a great opportunity for getting years of very cheap sailing, plus something impressive to add to your CV, college or job applications. If you start volunteering with us and do well, you could gain invaluable experience in leading and motivating teams, looking after safety issues, taking responsibility and more - especially if you end up volunteering on some of our voyages with highly disadvantaged and vulnerable young people. If you’ve had a recommendation from the skipper, it’s still really up to you to decide whether you are keen and ready to take this step - moving from being a young crew member who can be looked after and supported by the sea staff, into a position of responsibility where you will be looking after other people and responsible for helping to deliver a successful voyage to others, and accepting that this can involve hard work - though we hope our volunteers also have plenty of fun! Junior volunteers will still get support and advice from more experienced sea staff, but you really have to be ready to get stuck in when there are things to do and your effort can help make the difference to keeping the boat working smoothly and ensuring that another group of young people has the best possible experience. But the next stage is really up to you. There are plenty of young people who impress us on voyages each year, but the ones who get to come back for more voyages, training and qualifications are the ones who show a real interest and make the effort to keep in touch - we simply don’t have the time to chase all of you individually if we don’t hear from you. Reading this weekly newsletter is vital - you will see when we are advertising for trainee mates or bosuns, or offering courses, or asking for help with maintenance or other events. You may also sometimes see that we have a short-notice vacancy for a crew berth - if we can’t fill the place with a paying customer, offering it as a cut-price or even free place to a new potential volunteer whom we know will be an asset to the team is much better than sailing with an empty berth. So if you are keen, PLEASE read the bulletin and don’t be afraid to reply and ask questions - if you’re not sure whether an opportunity is suitable for you or not, or if there might be age restrictions, just ask. We really do want to hear from you! If you read this newsletter regularly, you will see that the key period for sending in bids for volunteer berths tends to be November to early January. Every year we get a few people who haven't read the newsletter and don't start thinking about summer sailing until the new year is well underway - only to find that volunteer berths in school and college holidays are already booked up. And one more thing ... if you are mature enough to be thinking about making the step up into volunteering, then you should really be contacting us yourself. It doesn't quite create the same impression if you get your mum to do it ...! Raise And Sail is a section of this website full of ideas, information and support for young people who would like to raise money in order to come sailing with us. Huge thanks to Fiona Keen and Emma Burrows for putting Raise And Sail together. We hope you will find it useful - let us know how you get on as we can add success stories and new ideas to the site in due course. 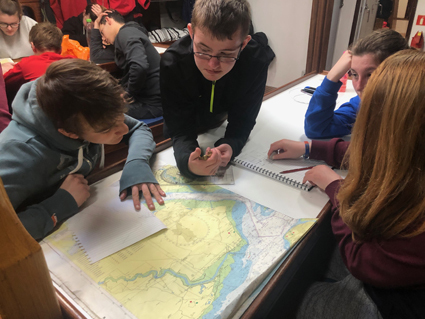 OYT South has been offering basic navigation training through the RYA's Essential Navigation & Seamanship course - do have a look and sign up if you want the qualification. For those of you who want something a little more advanced, one of our relief skippers, Simon Jinks, is offering online distance learning systems for the theory courses for Day Skipper, Coastal/Yachtmaster and Yachtmaster Ocean. Simon is a great sailor and a top instructor so this is very highly recommended. Details here. He is also offering a one-day Weather for Sailors course. Please note that Simon's website also includes Essential Navigation and the PPI course, both of which OYT South can offer in-house. With our own courses and Simon's we now have navigation courses to suit everyone from total beginners right up to the most advanced level - please give it a go and do ask for advice if you are not sure which course is right for you. We are on Facebook at https://www.facebook.com/oytsouth - please do give us a Like! If you were friends with John Laing on our old page (https://www.facebook.com/johnlaingsailing please do move to the new page now. We are also on Twitter @oytsouth so please follow us! Please note that OYT South has a policy that our adult staff and volunteers should not make or accept individual online friend requests with crew members aged under 18. Young crew members can use the sites to stay in touch with the boat and with each other, but not with individual adults. If you have recently registered your interest in OYT South, welcome to our newsletter, which is sent out almost every week, normally on a Friday, and is also copied onto the website. If you have just started receiving this newsletter by email, it is because we believe you have signed up and consented to receive it - perhaps by emailing us to ask for it, completing a form on our website, or adding your email address to the book on board where people can sign up to receive news, as well as leaving comments. If this was a mistake or you simply decide you want to stop receiving the newsletter, just press “reply” to the email and write UNSUBSCRIBE at the top, or email webmaster1@oytsouth asking to unsubscribe. Each week the newsletter includes a wide range of news from the boat and from the charity, including details of voyages available for young people; adult voyages; opportunities for adult volunteers both ashore and afloat, and much more. We find that while some people read the bulletin almost every week, many others dip in and out, and read it when it's convenient - which is why some items are repeated. New items are marked with an asterisk * so that if you did read it last week, you can see which sections you can safely skip. Please feel free to join in any OYT South activities - nothing here is restricted to long-standing members or people who already know one another. New people are always very welcome! If you need an introduction to the work of OYT South, you should find a lot of useful information on our website. But essentially, we are a registered charity (no. 1079959) which exists to offer adventure under sail as a personal development opportunity for young people aged 12-25, from the widest possible range of backgrounds. 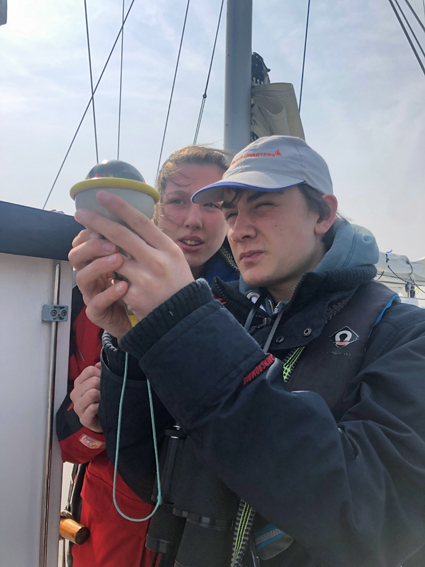 A high proportion of our young crew members are disadvantaged or deserving in some way: many of these sail in groups organised by other charities, youth clubs, special schools and so on, and will fill the bulk of our term-time voyages. But those from more fortunate backgrounds are also welcome to sail, either in groups or by coming as individuals on a mixed voyage. Every year we run a variety of shorter local voyages plus longer adventure trips - sometimes including Tall Ships races during the summer holidays. If you are aged 12-25 and hoping to sail as a crew member, take a look here - and this section is also useful for adults who are thinking of organising a voyage for a young person. Adults planning to organise a full group voyage should also see here. Adults who want to sail themselves should see here. We have a professional staff skipper and engineer, but our watch leaders are normally all volunteers, who combine sailing skills with an interest in working with young people. You can find more information here - how the system works, how to join, and profiles of existing staff and volunteers. To volunteer for OYT South ashore, please see here. To help with the vessel's annual refit, see here. It is a very expensive business maintaining a boat, running an office and employing staff. If you want to help us, please become a member of OYT South. Or see here for information on making a donation. If you have any questions, please do email - or contact the office. Many thanks to all those who have given consent to receiving this newsletter by email. If you are not currently getting it by email and would like to, please just click here Newsletter Subscribe and press "send", or email webmaster1@oytsouth.org.